Superior aluminum railings are maintenance free and available assembled or unassembled in ten different colors. Series 950 was developed to meet state, local and federal ADA regulations and guidelines and is always in stock at Security Fence Company. The non-welded Series 500 Pipe Railing and Series 550 Pipe Picket Railings are also available and can be fabricated to meet your needs. The narrowed 2" maximum top rail on the Series 950 allows for normal grip on ramps, stairs, or on horizontal railing and still maintains a pleasing and aesthetic look. The Series 950 Railing is used on office buildings, commercial applications, hospitals, industrial and educational environments, as well as apartments and homes. 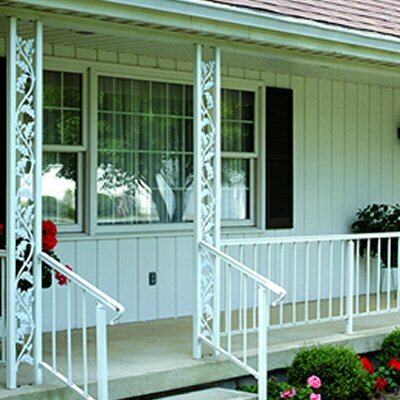 Superior Aluminum Non-welded Series 500 Pipe Railing and Series 550 Pipe Picket Railing are especially designed to utilize all the advantages of aluminum, where strength, durability and no-paint maintenance are key factors. Highest quality aluminum extrusions and castings are used with concealed fasteners, offering a smooth finish, making it the finest contemporary design available on the market today. Components are easily assembled without welding by using mechanical fasteners at intersections and epoxy structural adhesive at splice joints. Factory assembled (Series 500 or 550) railings are made to your exact specifications, resulting in further on-site fabrication savings. Special curves or pipe radius can easily be fabricated to fit your job. This makes for a practical sound investment for the budget-minded buyer. Posts and top rails are assembled to run in continuous lengths. This results in a system that is stronger than one with cast tee and cross connections, and it provides a continuous smooth top rail surface. The Series 550 pickets are factory assembled with a tight drive-in-fit to the top and bottom rails to assure squareness and rigidity. Preassembled sections up to 24 feet can be shipped factory-assembled or knocked down for reassembly.